Surprisingly, it looks better with two shades of blue. The design with two shades of blue can be found on the Web, for example in patches or illustrations, but seems that there are currently no flag photos. On the other hand, there are examples of the flags with a single shade of blue, like the one photographed in Portland, Maine, on 21 June 2008 or the one from Kalamazoo, Michigan, which was used at the Kalamazoo Pride 2011, with photos available here and here. A similar flag was seen in Edmonton, Alberta at the Edmonton Pride Parade 2008, but this one has two shades of red, the cross being darker. Another photo from Edmonton was taken on 12 June 2010, but the shades are not easy to detect here. Photo of an unusual variant, with light blue stripe and canton and a very dark cross, indigo or very similar, can be seen at a Christian right website (WARNING: contains vocabulary which may be qualified as hate speech). Unfortunately, no source for this illustration was given, so it cannot be determined if it is really from Des Moines, which is the site of page topic. The putative international version, with white star added to the crescent, of this Canadian Muslim flag. Yet another Islamic gay flag design is at this site. Above, a putative reconstruction of a possible real flag (with white crescent and star over all). The use of flags described below was not recorded in Israel so far, which is why they are described as Jewish, not Israeli gay flags. A rainbow flag with a blue Star of David in the center was used at the Rainbows Festival in Phoenix, Arizona, on 7 October 2006. It has also appeared at the Chicago Pride Parade on 29 June 2008, as well as at the commemoration held on 5 August 2009 at the Temple Israel, Boston, for the victims of the Tel Aviv gay centre shooting which happened four days earlier. A photo of the flag was shot in Warsaw, Poland, some time prior to 8 June 2010, when it was posted at the Jewish Women's Archive website. The Or Chadash Congregation, whose members carried the flag at the Chicago Pride Parade 2008, also sells its copies. Most of these photos show the flags with the star darker than the blue stripe, but there are a few examples when the star was lighter than the stripe. Another Jewish gay flag is white, with a large blue Star of David in center and borders in rainbow colors, red, orange and yellow at the top and green, blue and purple at the bottom. Unlike the Israeli flag, it has no white stripes at the top and bottom edges and the star is much larger. The shade of star is darker than that of the blue stripe. The flag was carried at the San Francisco Pride Parade 2009, 2010 and 2011. 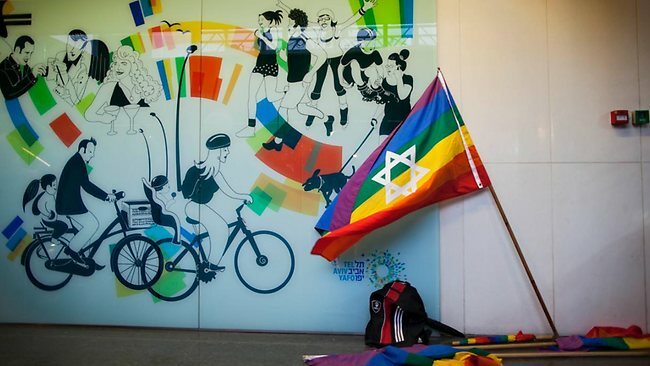 Although the flag is often described as the "Israeli LGBT Flag" (here, here), its use in Israel was not confirmed so far. On today's online version of the Israeli newspaper Yedioth Ahronoth, shows a variant of an Israeli gay flag. The flag was already reported. For now, it might be better described as Jewish instead of Israeli gay flag, considering that all the examples of its use were from the USA. The third flag is the most similar with the Israeli flag. It replaces each of blue stripes with three narrower stripes in different colors, red, orange and yellow at the top and green, blue and purple at the bottom. White borders are reduced to the width of one colored stripe. All colors are darker than on the other Jewish gay flags; in addition, the star is darker than the blue stripe. This flag was carried at the San Francisco Pride Parade 2009 and 2010. I found an Israeli LGBT flag. While looking for some other flags, I did come across a couple of photos of this Israeli LGBT flag (or should we better call it, Jewish LGBT flag - its use in Israel is yet to be verified), but somehow it didn't look much real to me - it is rather complicated to produce a flag with such a design and, considering the development of image editing software, perhaps might be easier to repaint the standard Israeli flags on photos. That is why I neglected them for the time being, but now this flag's existence is verified. One difference though is that the coloured bands go all the way to the top and bottom edges unlike the standard Israeli flag. You're right about maybe calling it a "Jewish" rather than "Israeli" flag in the absence of sighthing where it would be the citizenship rather then the ethnicity/religion that is meant to be represented. This flag was seen at London Pride Parade on 3 July 2010. Until its use in Israel is verified, it shall be considered Jewish, and not Israeli, gay pride flag, although it is derived from the flag of Israel. On this flag, the Shield of David is replaced by a resembling pattern composed of six triangles in rainbow colors, red at the top, the others arranged clockwise from orange to purple. Its photos can be seen here and here. Another flag with borders in rainbow colors was seen at 64th Celebrate Israel Parade in New York City, which took place on 5 August 2012; the photo can be seen here: https://www.huffingtonpost.com/mordechai-levovitz/gay-jews-march-first-time-celebrate-israel-parade_b_1570861.html. Its more recent photos, taken at New York Pride Parade on 25 June 2017, can be found here: https://www.bethelnr.org/photo_gallery.php?album=4735, here: https://jewishweek.timesofisrael.com/at-ny-pride-parade-intersectionality-catches-lgbtq-activists-in-crossfire/, and here: https://www.lgbtqnation.com/2018/06/israeli-ambassador-praises-us-exit-council-fighting-lgbtq-rights-pride-reception/. On this flag, both top and bottom borders are occupied with complete sets of rainbow colors, red being the outermost. It is also visibly more oblong than other flags with similar designs. Israeli gay rainbow flag with the Shield of David in center was used in Paris, on 27 January 2013 and in London, on 3 July 2010, so it shall no longer be considered just Israeli, but Jewish gay pride flag, regardless of the users' citizenship, an ambiguity not unlike that which is a feature of the national flag of Israel. Just like the generic rainbow gay flag, this flag may clearly be used either with purple or with red field at the top. The flag variant with the red stripe at the top was used in New York City, at the New York Pride Parade 2010. Just like the plain gay rainbow flag, it may be used either with red or with purple on the top. The latter variant can be seen here (image). Both of these variants are being more and more used by the Jewish diaspora, so they are no longer only Israeli, but also all-Jewish flags. The flag was also used at the Stockholm Pride 2013, as shown here and here. These sources reveal that the variants with red and purple stripes up can be used together, just like the generic Gay Pride / Rainbow Flag. A variant has also appeared with the Star of David pointing sideways. Its use was recorded only in Toronto so far, on 3 July 2011 (photo, photo) but, being the variant of an Israeli-originating flag, might be considered as Israeli, too. These sources suggest that the flag was hoisted horizontally there, although the design seems more suitable for a vertical flag. Perhaps, as you suggest, it was meant to be vertical, or perhaps it was thought it looks better this way, as the point is at a point where the stripes meet. By the way, you see many rainbow/pride flags in Israel, even in conservative Jerusalem, but I think I've only seen plain stripes, never "Israeli" or "Jewish" variants. Perhaps the frequency of their appearing on the photos is unproportionally high, compared to that of their use in real life. Certainly, they are more interesting to the photographers than the plain flags, which are not specific to Israel. Queer Pagan Flag represents the LGBT followers of neo-Paganism. It displays a disc in rainbow colors, charged with a black pentagram, on black field. The flag was originally designed in 1997 by Laura Anne Seabrook of Sydney, Australia, and the present version, modified so as to be made more inclusive in terms of the users' religious beliefs, dates from 2005 , when a copy of the flag was made and carried by its designer at the 2005 Sydney Gay and Lesbian Mardi Gras march [2, 3, 4]. The inverted version, with the upside-down pentagram, was created later for the followers of "Left Handed Path"  and a further derivation is the Fey Pagan Flag, with the same meaning, but the field and pentagram are in rainbow colors and the disc is black, the pentagram again being either upright or inverted . While these derived variants seem not to have appeared in real life so far, the basic version is already being manufactured .